These taste very close to the real thing… only better because there is no starch!!! Blend in food processor with ¼ cup water. Strain in nut mylk bag. This will get rid of cauliflower taste. Blend in food processor until desired consistency is reached. Add salt to taste. Hand mix in chopped parsley. Blend all in blender except for 4 mushrooms. Chop remainder mushrooms and stir in. Using hot water will make the gravy warm! 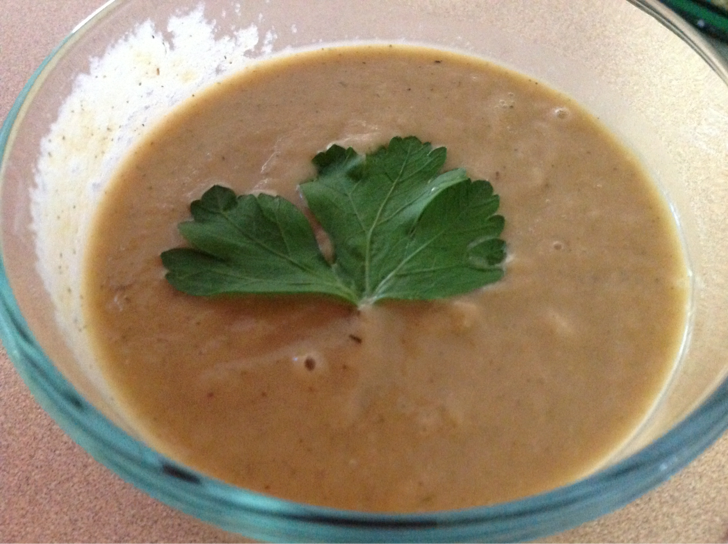 Put on top of Mashed “Potatoes” or any other dish calling for gravy! These are super savory and fresh tasting! Slowly add in water until well blended. Once all water is poured in, let blend for at least 2 minutes. Spread on teflex sheets (you will need 2) and put in dehydrator at 104 degrees. Flip half way through drying process. Cut into squares once crackers are formed. You can then place them back into the dehydrator until desired firmness is reached. Ill have pictures tomorrow once it is complete! Thanksgiving.. The Best Time To Be Raw! Holidays… Especially those revolved around food are my absolute favorite time of year! This is when I get to show off to all the SAD eaters how awesome it is to be raw and how pretty and appetizing raw dishes look! I know it is not that hard to make a dish look prettier than a dead carcass, but the level of amazing raw veggies can look on a plate is truly mind blowing. Everything is so bright and lively looking! And the best part is you are bright and lively looking when you are done eating instead of dead on the couch like a sack of potatoes! We don’t need to feel like crap or worry about the holidays! It’s a joyous time!! I went shopping today for all the ingredients and I will post up every recipe! All of these items I am making is enough to serve 5 or 6 and it cost me under 100$. I don’t want to hear ever that its too expensive to eat healthy! Everything was also purchased organic and local when possible! Blend all ingredients except tangerine and jalapeño in food processor until desired consistency is reached. Add in diced tangerine and jalapeño and mix by hand. Let sit in refrigerator over night to let the tastes blend together. Done! I will keep posting as I am making! These are super easy, super fun, and super yummy! chili powder, cumin, coriander and cayenne to desired taste. I use roughly a teaspoon of each, except 1/2 teaspoon of coriander. Combine all ingredients in food processor and mix until chunky, but blended consistency is formed. Add all ingredients except water in high powered blender. Slowly add water until thick but creamy consistency is formed. Combine all ingredients in high power blender until creamy. chop all ingredients and stuff inside collard leaf. cut out thick part of stem. fill ingredients in the center of the leaf. fold over right side, tucking the back, loose part of the leaf where the stem used to be. 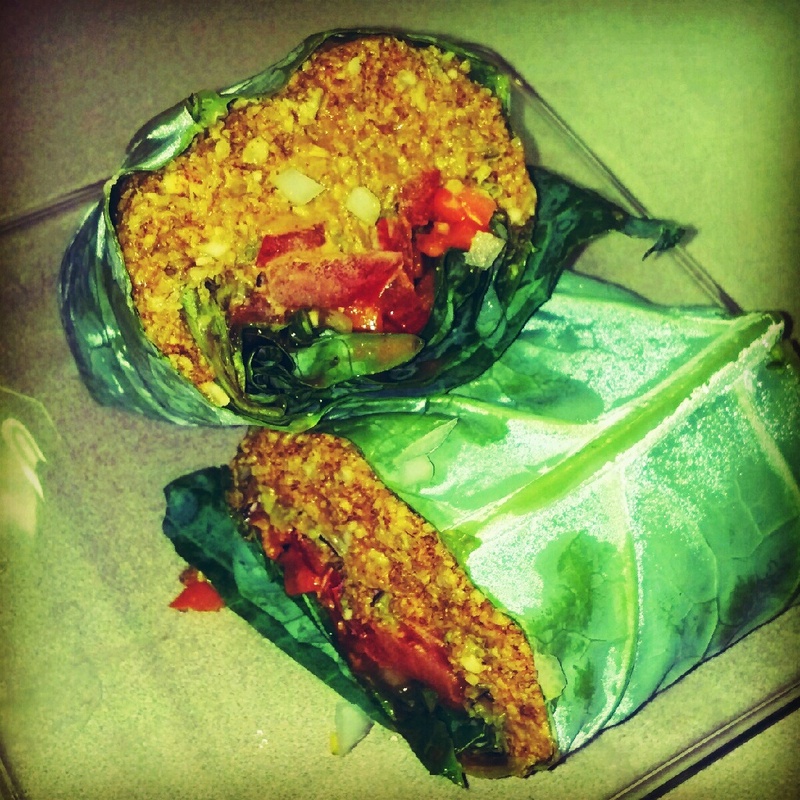 Fold over the top of the leaf so the filling is now pocketed. Rotate burrito to the right, and roll burrito over so it is assembled. 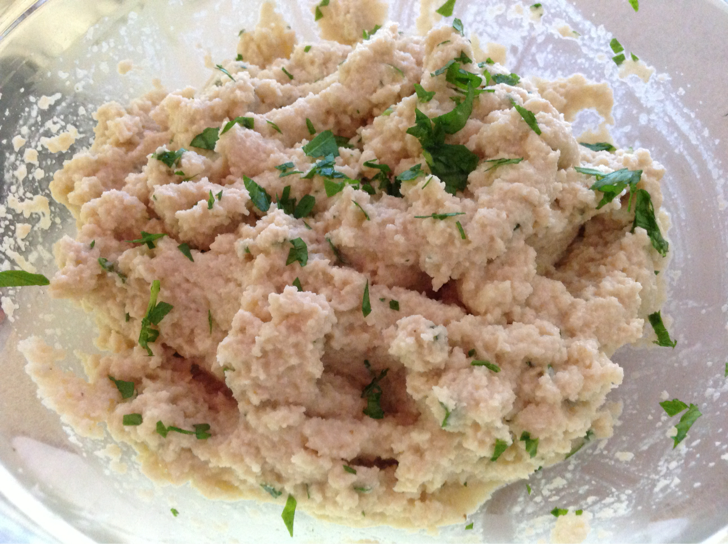 Here is a great butter alternative that i whipped up this morning to go with my bread i made! Its creamy and salty and did the trick! It is high in really good fats too so it is great to have in the morning to get that brain pumping and ready for the day! Put all ingredients in a mortar and pestle and grind down the seeds and mix well. Put in refrigerator until hard, or if its cool in your home leave on the counter for a more creamy texture! This Smoothie is sweet and sour and will really boost up your morning! Put all ingredients in blender and enjoy! Add more hemp milk to thin out if desired or some ice to make it cold! This is a super fast and simple recipe and easy to take with you! 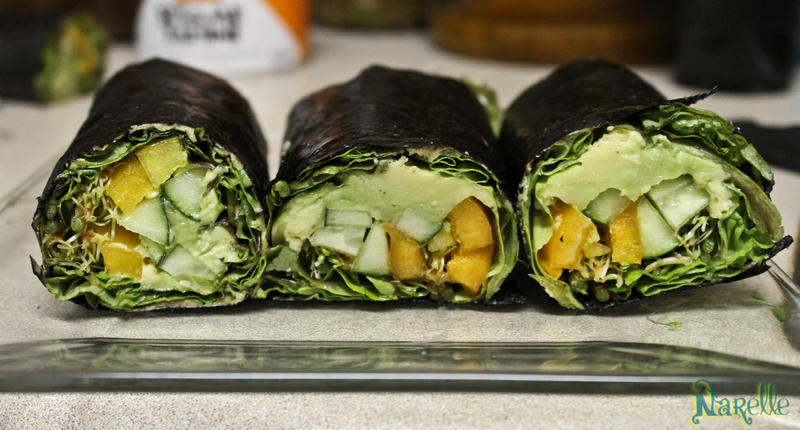 Nori will bring you many minerals and has many health benefits… something a regular wrap does not have! Instead of using a flour wrap that has nothing to offer, use something that will actually add something positive to your well being! Lay nori sheet so shiny side is face up. Spread a thin layer of tahini on the sheet , especially on the edge. This will be your glue! Towards the opposite edge of the sheet lay your greens down, followed by slices of the vegetables. I usually lay down the avocado first and add the peppers and cucumber. Top with sprouts and watercress. Now to roll it up! 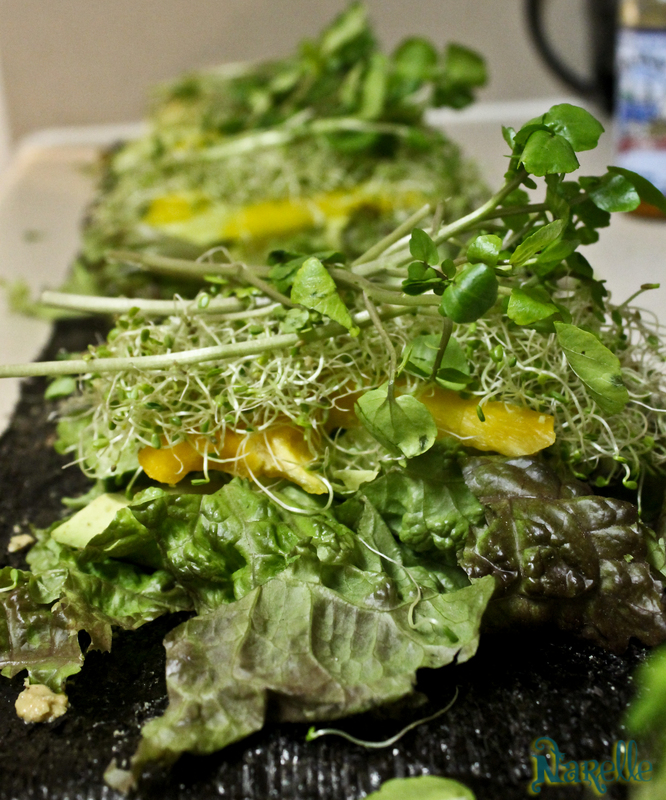 Start by folding one end of the nori over the food in it. Tightly begin to roll it up and seal with the tahini. Cut with a serrated knife and dip in your favorite sauce! These are incredibly filling due to the high vitamin and mineral content!